Happy Saints: 20% off Happy Saints ‘Jesus is Risen!’ eBook! Happy Saints ‘Jesus is Risen!’ eBook at 20% off! We are fast approaching Holy Week and Easter… how do you plan to celebrate and share the Resurrection of our Lord with your family, students or friends? How about praying the STATIONS OF THE RESURRECTION? The Stations of the Resurrection (Via Lucis - the Way of Light) is a devotion that journeys through the events after Jesus’ Resurrection until the Pentecost. It is a joyful way to celebrate the glorious Resurrection of Jesus and is a great complement to the more sorrowful Stations of the Cross! 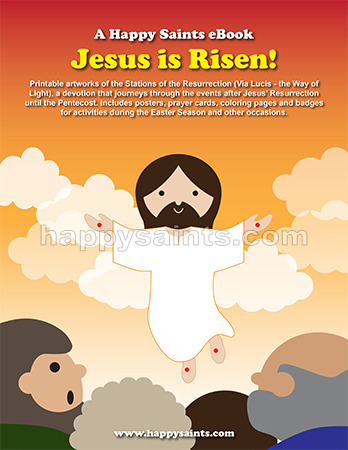 The Happy Saints ‘Jesus is Risen’ eBook features the 14 Easter stations in printable posters, prayer cards, greeting cards, coloring pages and badges!